Take the dirty work out of vacuuming. Add a new level of convenience to your daily cleaning routine with the Clean Base Automatic Dirt Disposal. Included with the Roomba i7+ and compatible with i Series robot vacuums, it holds up to 30 bins of dirt, dust, and hair so you don't have to think about vacuuming for weeks at a time. Your partner for a cleaner home. Keeping your home clean can feel like a never-ending task. That's where the Roomba family of robot vacuums comes in. Combining powerful cleaning systems with intelligent sensors, iRobot's vacuums move seamlessly through your home, adapting to the surroundings and thoroughly vacuuming your floors — leaving you with more time for what's important. Hard floor care made easy. 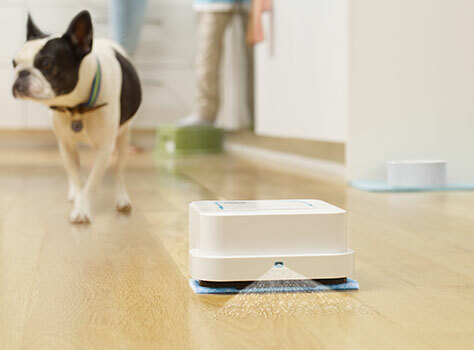 Braava mopping robots tackle dirt, stains, and grime, delivering fresh, clean floors every day. No matter the floor type, no matter the room size, there's a robot mop that fits your hard floor cleaning needs.